Aquaculture System is an easy way to get started in fish farming. Simple to set up and maintain, it incorporates everything that’s great about aquaculture on a manageable scale. Use it to produce clean, wholesome fish for you and your family year-round, for an excellent introduction to fish farming if you’re considering commercial scale production, or as an outstanding teaching tool for the classroom. Growing a fish like tilapia is easy and you can grow over 100 lbs at a time in the Aquaculture System! An optional window in the tank makes learning fun because students can make observations as the fish interact with each other and their environment. The System is suitable for many other species as well, including catfish and ornamentals. Daily maintenance consists of feeding your fish and the simple act of opening a valve to flush the solids from the collection chamber. That’s it! Extremely economical to operate, your Aquaculture System uses less than 10 gallons of water a day and less electricity than a 60 watt light bulb. 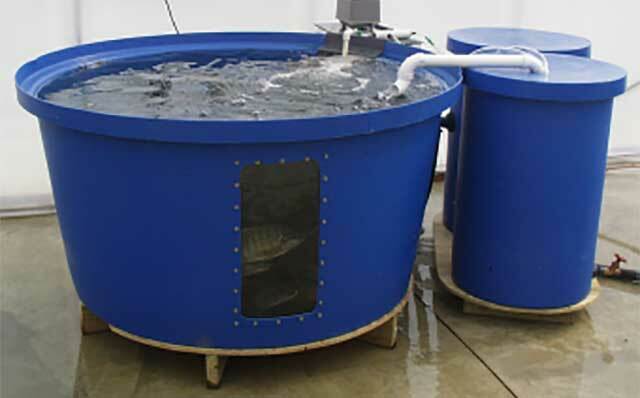 Aquaculture System is made with durable, professional quality materials that are fully warranted. It comes complete and ready to set up with a 300 gallon fish tank, filtration unit, UL-listed air pump and all the plumbing you’ll need to make it work right out of the package. The tank’s convenient size fits right through a standard doorway and the easy to follow instruction book guides you through the simple steps for setting up. Viewing Window: This Viewing Window installed in the side of the fish tank allows you to see the fish swim by in the tank. The window is a nominal 1'x2'. ~ This item must be ordered with the system, as we install it in the tank for you. Float Valve/Auto Fill: Float valve for automatically filling the aquaculture tank with water when the level drops due to evaporationor cleaning. Tap Water Conditioner: Tap Water Conditioner in 1 gallon jug. Used for Removing Chlorine and detoxifying heavy metals. Treats up to 75,700 gallons of water. Thermometer for Fish Tank: Digital Thermometer For Fish Tank with submersible probe . Displays both air and water temperatures in degrees Fahrenheit.~ Has 4 different alarm functions for monitoring the conditions. Fundamentals Of Aquaculture: Fundamentals Of Aquaculture by James W Avault, Jr, Ph D. A very easy to follow text of pratical aquaculture covered from A-Z. Everyday problems worked on pond construction, feeding, disease control, and more. ~Also included is a comprehensive guide for the beginning fish farmer or aquaculturist, and a reference for someone established in aquaculture. There are study questions and an extensive reference section at the end of each chapter. This step by step guide to commercial aquaculture containes over 900 pages, over 280 photos, and more than 50 illustrations. Author:James Avault, Jr. Seed Starter Kit: Seed starter kit for Aquaponics system. Includes a tray, dome, and rockwool media.